A new report from think tank New Financial in collaboration with the PLSA, Diversity from an Investor’s Perspective, looks at why and how the most forward-looking asset owners (such as pension funds, insurers and sovereign wealth fund) are addressing diversity and inclusion. 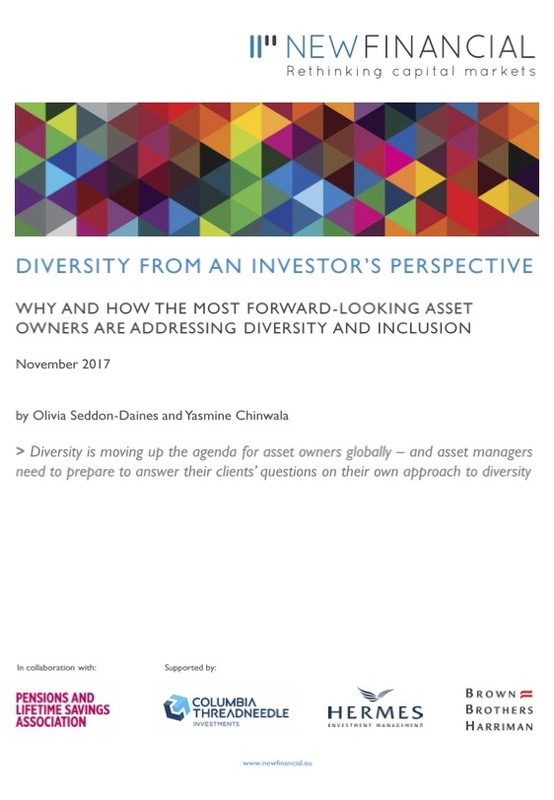 This report for the first time collates ideas and action points from the most progressive asset owners on the subject of diversity (in the people sense of the word rather than in terms of investment diversification). The research follows on from the PLSA’s Breaking the Mirror Image campaign to encourage trustee board diversity. New Financial researched 100 asset owners globally with combined assets of more than $8 trillion, and conducted more than 40 interviews with a wide range of investment market participants. The research found diversity is moving up asset owners’ agenda, with three-quarters mentioning diversity in their annual reports, and nearly half (45%) expressing their motivations for tackling diversity. Their top three reasons were to improve decision making, to attract and retain talent, and to innovate and compete. Moving up the agenda: Nearly three-quarters (74%) mention diversity in their annual reports. Interest and activity around diversity have accelerated over the past two years. Why diversity matters: Almost half (45%) of asset owners explain why diversity is important to them, with the top reason being to improve decision making. But there are still many people and organisations throughout the investment chain who are unconvinced and believe a focus on diversity compromises financial performance. Seeking change from the inside out: Asset owners are tackling diversity both internally (across their investment function and on trustee boards) and externally (by stepping up engagement with investee companies, including diversity criteria in manager selection, and allocating funds to target diverse groups). 42% say they are addressing diversity internally, 41% discuss how they are engaging on board diversity and 13% use diversity as a theme for portfolio allocation. Influencing manager selection: Diversity is beginning to influence manager selection - diversity criteria are coming up more frequently (in requests for proposal and investment consultants’ due diligence process), there are more questions and they are more focussed. Asset managers need to be prepared to answer them. Challenging managers: The interaction between asset owners and their asset managers is evolving from a purely transactional relationship to a more collaborative one. Some asset owners are actively challenging their investment managers and working with them to improve their diversity, as well as allocating to diverse managers. Becoming part of investor DNA: Efforts around the topic of diversity are generally initiated by passionate individuals, but increasingly their conviction is being translated into processes, structures and policies to formalise asset owners’ commitment to diversity, both internally and externally. This is an important shift towards sustainable change.